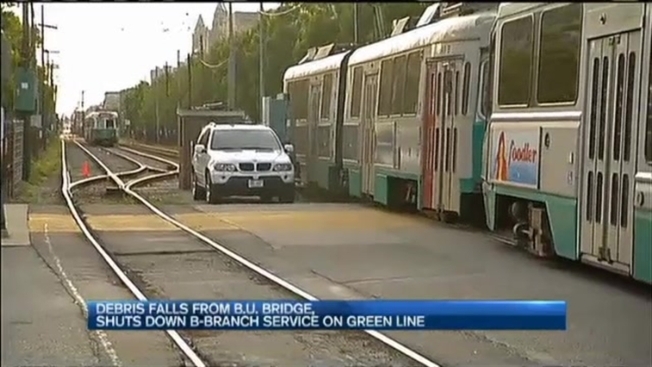 MBTA service was suspended Friday on part of the Green Line while crews inspect the Boston University Bridge. A worker with the Massachusetts Department of Transportation tells necn that once their work is complete, the bridge will be safe for full travel, adding that there was no structural damage. The B Branch trolley service was down between the stops at Babcock Street and Blandford Street. Officials with the utility said service would be down through the end of the night. Riders had to hop on a shuttle for about 10 blocks between Blandford and Babcock streets. At the Blandford stop, the outbound train switches tracks, then turns right back around. "It's a strange thing in Boston, why this happen?" asked Marco Campanla. A piece of debris, about two feet by three feet, fell from the bridge onto the Massachusetts Turnpike. It did not land in the travel lanes, but onto a construction area. A hole could be seen on Commonwealth Avenue near the BU bridge during Boston's busy rush-hour. But some trolley commuters say they were left in the dark. Work has been ongoing underneath the bridge on the central pier that holds it up. The pike has been down three lanes from four from the Allston toll plaza to just before Prudential Tunnel for some time now, but there has been no disruption to travel on the pike or the commuter rail. Buses along Commonwealth Avenue were running normally.